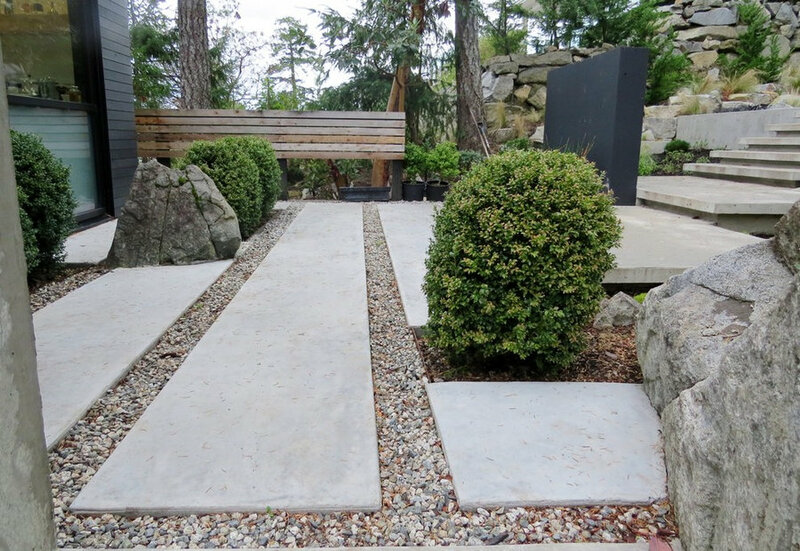 Client Brief: The clients requested that the design follow a rectangular theme and the principles of Japanese garden design philosophy. The functional purpose for the design was to create a connection between the clients’ mid-century modern style home and the site of a future studio as well as to provide the main access to the residence. 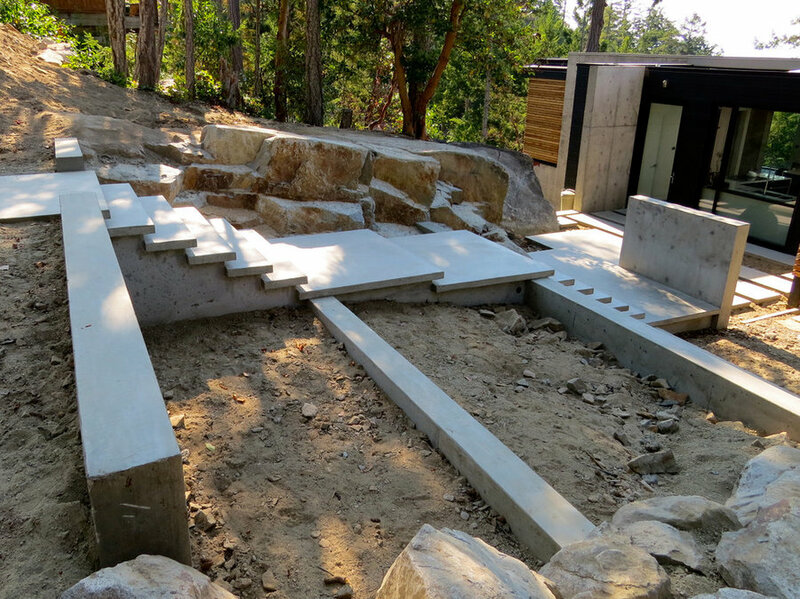 The site is steeply sloped with a 12-foot elevation change between the house and the studio site. 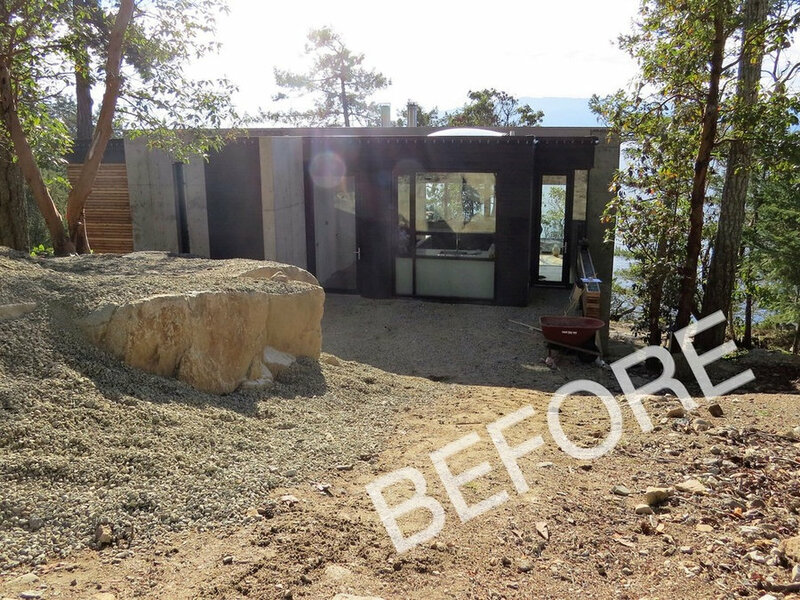 The site’s main challenge was a massive rock formation extending from the east side of the house to the studio site, which the clients wished to preserve. 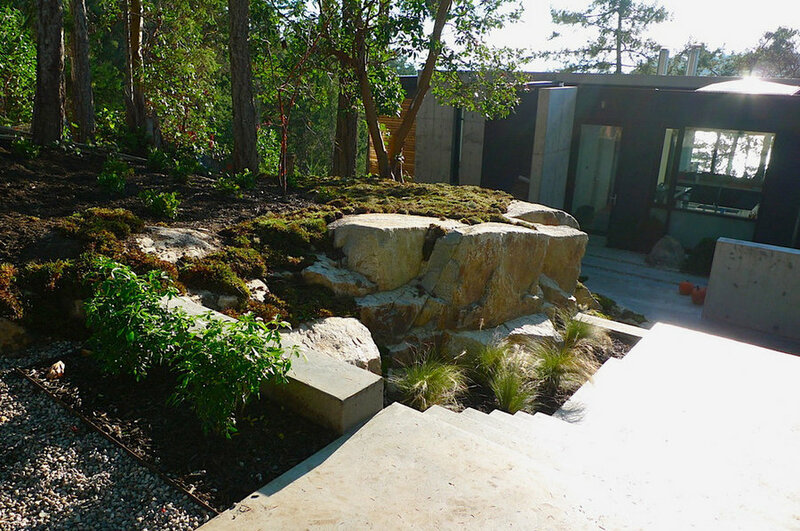 The final design was a response to the bedrock contours, the site’s topography and the coastal location. In consideration of the clients' brief, my main design objectives were: •	Preserving and managing the views •	Connecting the house with the surrounding landscape and respecting its coastal character •	Embracing the challenging topography of the steeply sloped site •	Accommodating utilitarian movement from the house to the studio site •	Controlling surface water runoff and erosion. 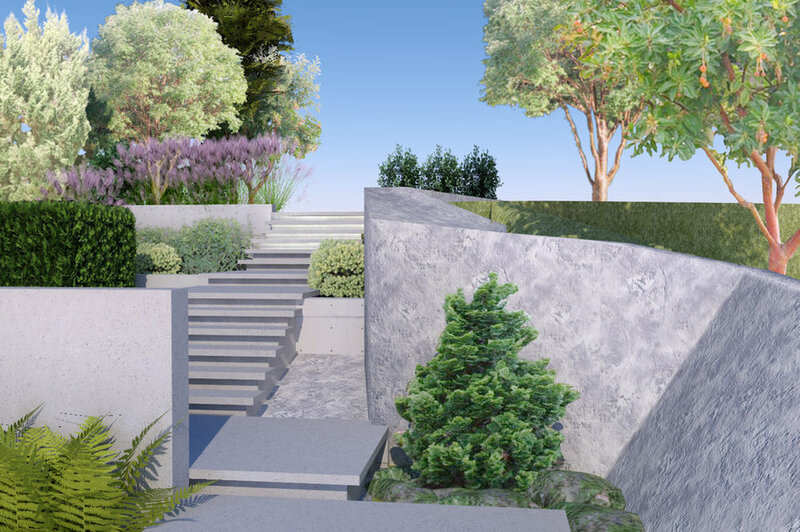 Design Solution: The trees and tall ornamental grasses are planted on the top terrace to conceal and frame the panoramic views and define the entryway down the two sets of “floating” stairs. 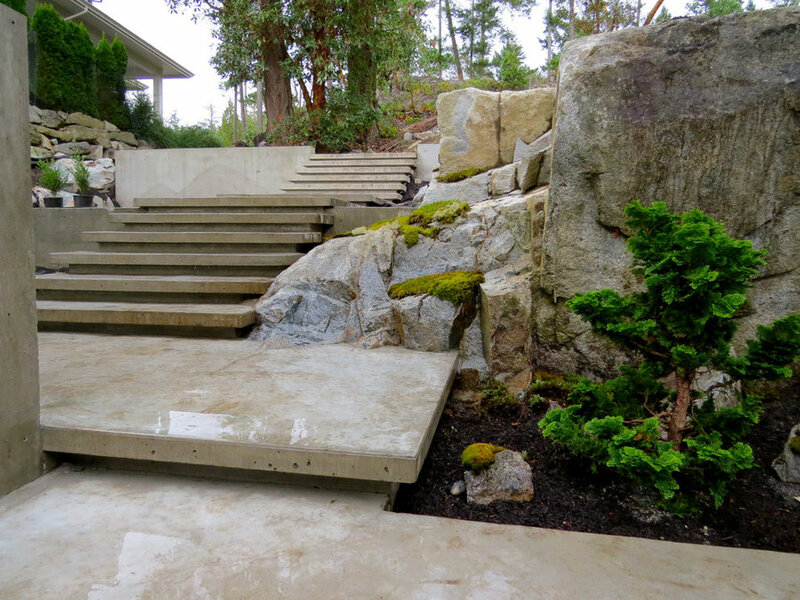 The stairway is connected by four raised platforms to the house entrance, where the ocean view is framed by windows and glass doors. The ocean view is only completely reveled from inside the house. This approach conserves the view, creating suspense and timing within the entry sequence. The architecture of the mid-century modern house is integrated with the landscape by extending the lines of the concrete wall into the landscape and by adding a floating steel trellis to the roof. The floating theme is repeated in the design of the cantilevered stairs and platforms. 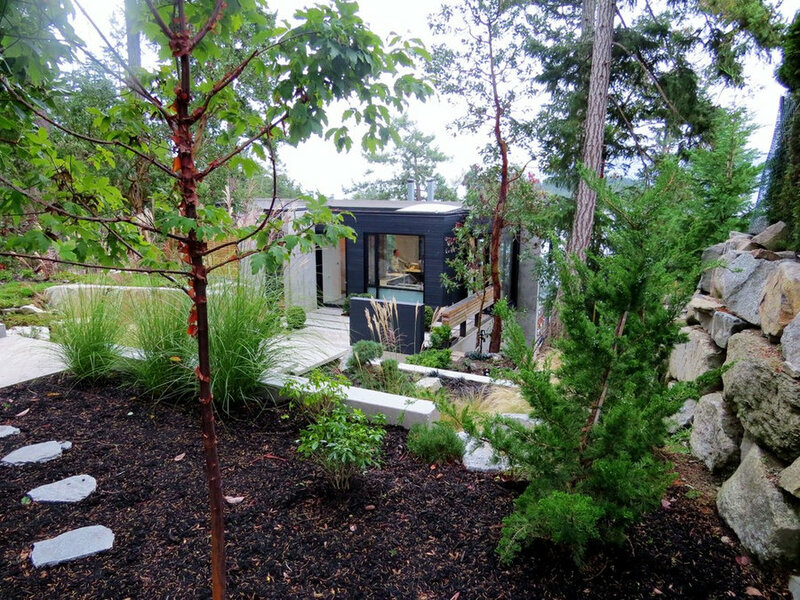 The connection of the house to the garden is further emphasized by the retaining walls, which are made of board-formed, cast in place concrete to mimic the house walls. 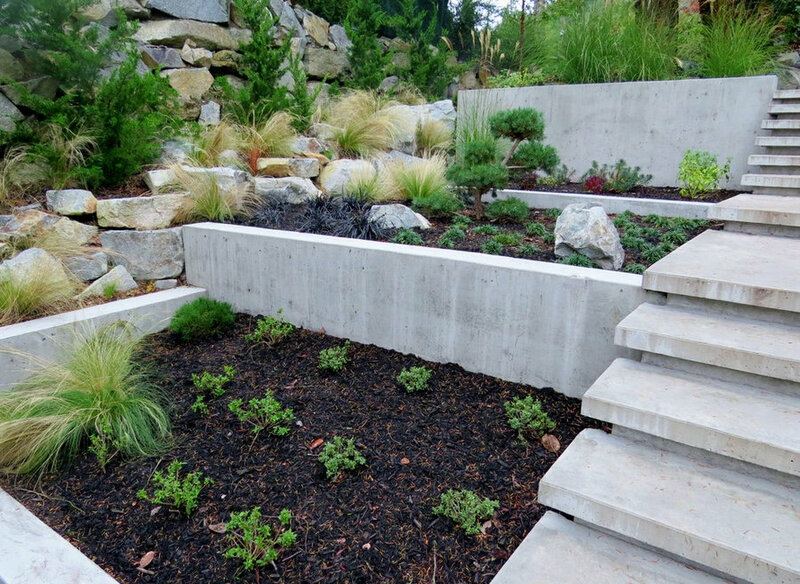 The slope on each side of the stairs is managed through a series of three integrated terraces. A series of small terrace walls are a much more pleasant and cost-effective solution to the slope problem than a single, massive reinforced wall. 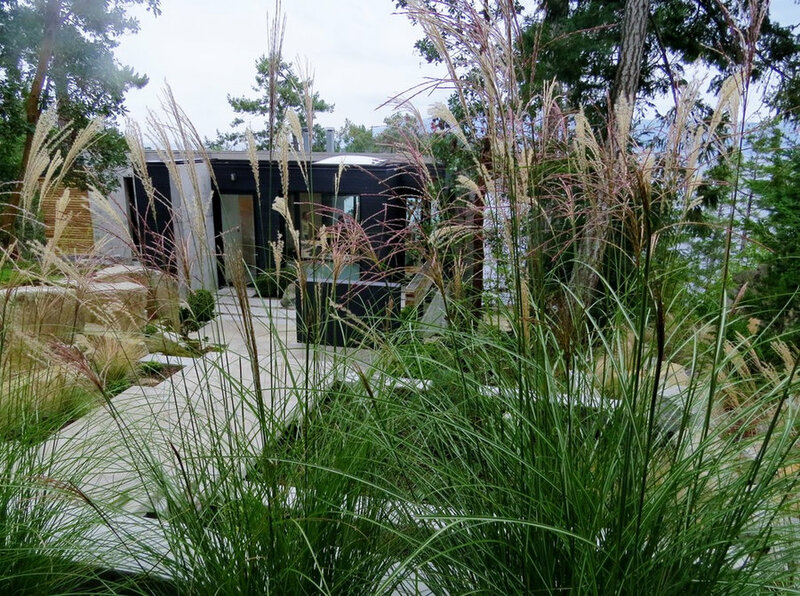 Every effort was made to incorporate the site’s natural beauty in the design, most importantly including an unobtrusive edge where the garden meets the natural landscape. 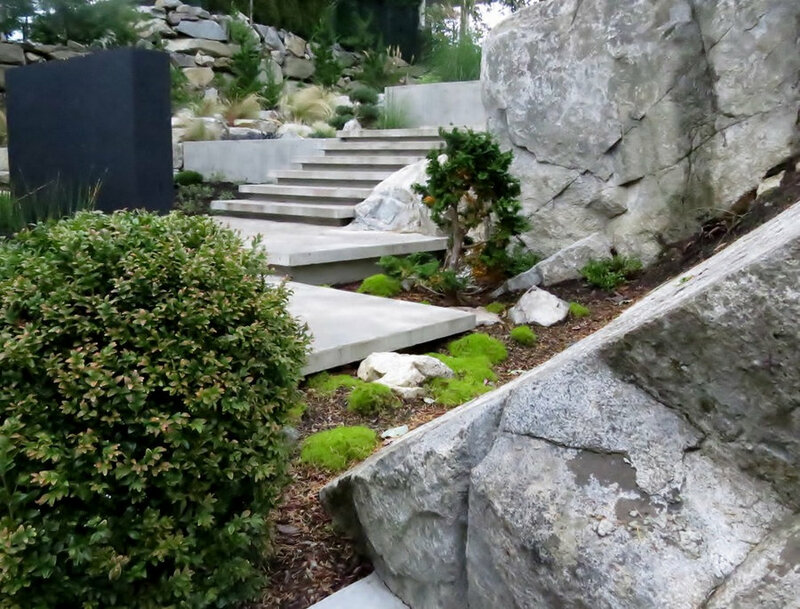 We used boulders excavated on site, ornamental grasses and Hollywood junipers to mark the transition between the natural and cultured landscape. The objective was to keep the design and detailing uncomplicated. 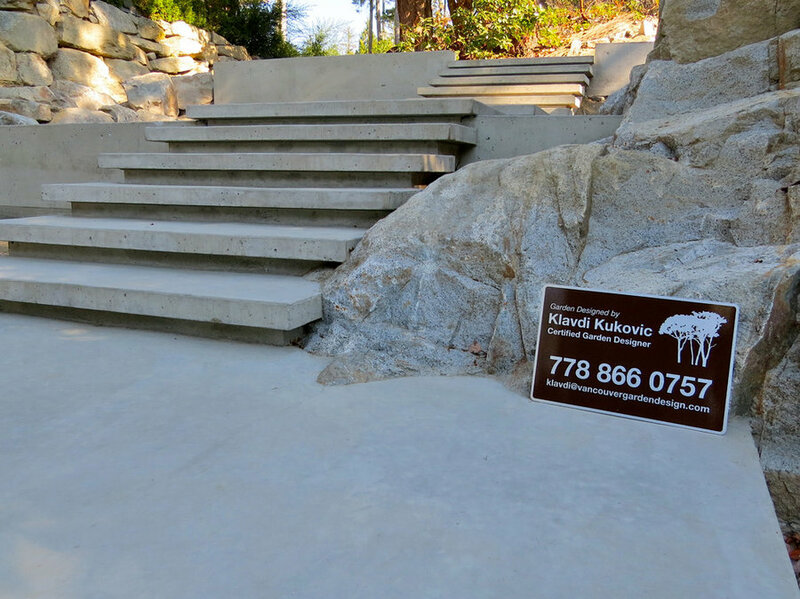 Two sets of stairs are interrupted by two platforms to break the 8-foot elevation difference. The proportions and dimensions of the stairs are generous, so as not to be overwhelmed by the vastness of the surrounding landscape. The steps’ nosings overhang by about 4 inches to achieve a floating feel. They are under-lit with LED strips. The raised platforms are 5 feet wide to allow an easy walking cadence with three strides on each platform. 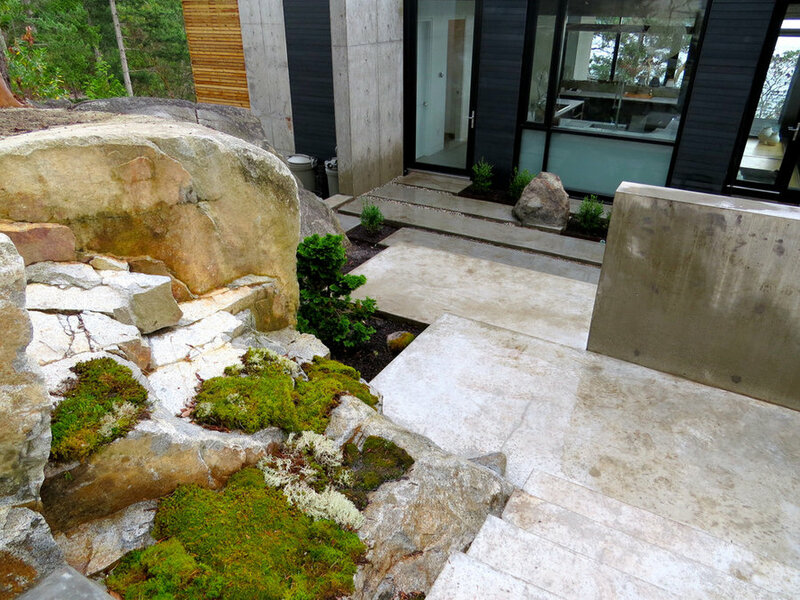 Respect for the place and its inherent beauty is shown through careful attention to the preservation of native plants (e.g., arbutus trees, salal and moss) and the existing topography.